Enemy deals 25 shelling attacks. Over the past day, Russia-backed separatists on 25 occasions breached the ceasefire accord in in the ATO zone. As a result of enemy attacks, one Ukrainian military was wounded. On every second occasion, Ukrainian servicemen returned fire using grenade launchers and small arms, ATO headquarters reported on Friday, 1 December. The least stable was the Luhansk sector, where the enemy fired mortars, grenade launchers and small arms at Troyitske and Luhanske. 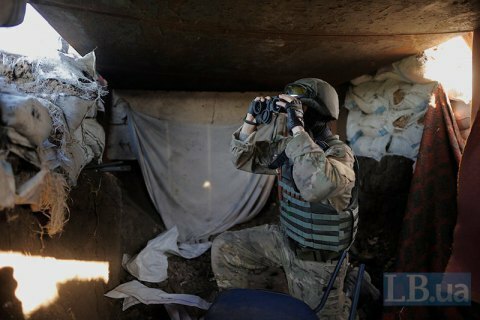 With the onset of dusk, militants released several mortar mines at Novooleksandrivka, Krymske and Novoluhanske. The enemy used small arms in the area of Zaitseve and Syze, and fired IFV weapons on ATO defensive fortifications near Lozove and Luhanske. In the Donetsk sector, the enemy intensified shelling attacks in the evening. In particular, in the coastal area, separatist groups fired 120-mm mortars and small arms. After 18.00, the invaders intensively fired grenade launchers and infantry weapons at the ATO support posts near Avdiyivka, Kamyanka, Pisky and Maryinka, Ukrainian defenders of Bohdanivka were under small arms fire. On Wednesday, ATO HQ recorded 18 violations of the ceasefire by the enemy. There was no casualties.